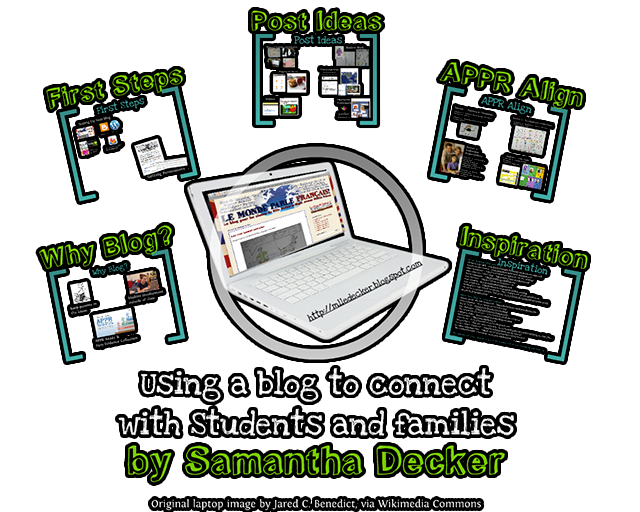 Back in March, I gave a presentation at the Capital Organization of Language Teachers (COLT) Annual Conference in Schenectady, NY, about blogging to connect with students and families. I thought I might share it here so that people could add to it. Some of the topics that I've explored here will get their own posts in the future. One of the topics I did not explore in this presentation is having students do the blogging, which someone in my audience had brought up. I haven't tried that yet (but I think it's a great idea and I would like to in the future), although I know there are a number of teachers who already do a great job of having students blog. One teacher that comes to mind is Silvia Tolisano at Langwitches Blog. You will notice that there is a topic called "APPR Align." Teachers in New York will recognize APPR as the Annual Professional Performance Review, a new teacher evaluation system implemented beginning in fall 2012. Even if you don't teach in New York, I think you'll find that section useful in how to present your blog with the proper rationale in either a portfolio or a performance review. After reading the presentation, make a comment below. What other activities or ideas do you have in mind to improve the blogging experience? What have you already written or read about the topic that French Corner readers might like to know about?